DALLAS (AP) - Mississippi State coach Vic Schaefer last year was showing the movie "Miracle" to his players and hoping for one. Now, the Bulldogs are living one. A year after an embarrassing 60-point loss to mighty UConn in the Sweet 16, the Bulldogs are headed to their first national championship game. Morgan William's overtime buzzer-beating jumper gave them a 66-64 victory over the four-time defending national champion Huskies in the national semifinals Friday night. "It was personal. ... We had to prove we're a much better team than last year," said Victoria Vivians, who led the Bulldogs with 19 points. "What an unbelievable gutsy performance that no one in the country, including all of y'all, probably thought could happen, and that's OK," Schaefer said. "But we knew it could happen." Just like the 1980 U.S. men's Olympic hockey that upset the heavily favored Soviet Union team on way to the gold medal, Mississippi State (34-4) still has one more game to play after ending UConn's 111-game winning streak. The Bulldogs, with four seniors and four juniors, will play South Carolina in an all-SEC matchup for the national title Sunday night. "This year, I wasn't showing `Miracle.' We weren't watching any movies, I wasn't talking about the Philistines slaying giants, although it was in the back of my mind," Schaefer said. "We beat the greatest team with the greatest streak in the history of sports." Schaefer was part of a national championship while on coach Gary Blair's staff at Texas A&M in 2011, then became Mississippi State's head coach. 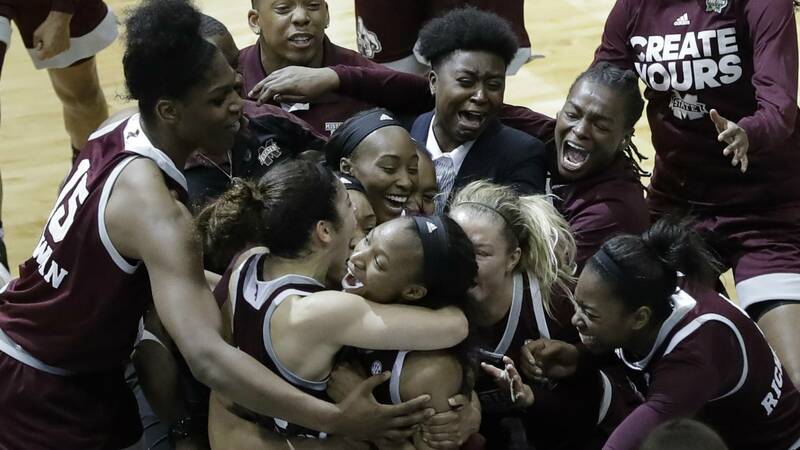 Now the Bulldogs are one win away from one of their own after perhaps the biggest upset in women's basketball history. "We didn't have to play them best-out-of-seven, didn't' have to beat them best-out-five," Schaefer said. "We just had to play them one time, beat them one time." Schaefer described his team has having tremendous heart and some pride, which got stepped on by UConn last season. William, who scored 41 points in Mississippi State's regional final victory over top-seeded Baylor, had 13 points against the Huskies. She had a layup attempt blocked at the end of regulation. "Ain't any shots bigger than then one she hit tonight," Schaefer said. "Well, Coach called the timeout. He was like, `Morgan, you can win the game.' That's what he said," William said. "When I made the shot, I was in shock. I'm still in shock."